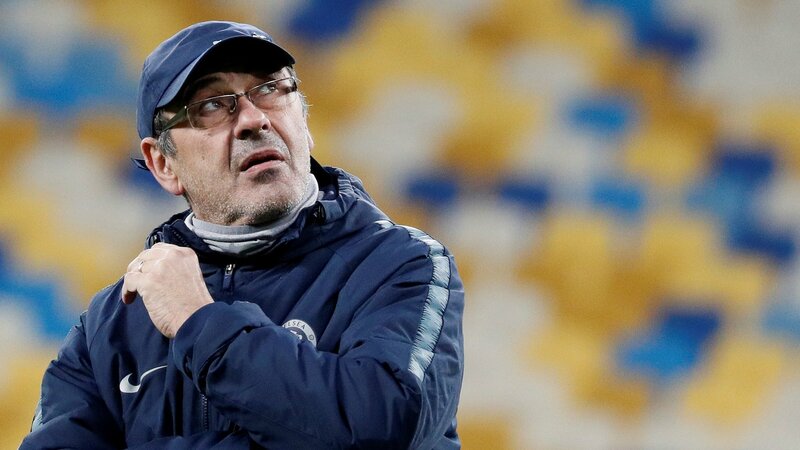 Dynamo Kiev’s Olympic Stadium pitch is “a disaster” and could cause injuries, manager Maurizio Sarri said before Chelsea’s Europa League last-16 second leg tie on Thursday. The Blues take a 3-0 first-leg lead into the encounter in Ukraine. The Italian, whose side trained at the stadium on Wednesday, said: “I think it’s [the pitch] really dangerous. He added: “I don’t understand why Uefa give so much attention to everything, like the players’ list, and then we have to play on such a bad pitch. It will also be very difficult for Dynamo. It’s a problem for us but also for our opponents. Despite holding a commanding lead, Sarri stated that this would be a “dangerous” encounter. “Mentally it’s a very difficult match, because we can undervalue the opponent,’ he added. “I know very well they are dangerous. I saw their other matches in the Europa League and they played very good football. Meanwhile, Dynamo manager Aleksandr Khatskevich said his team need a “miracle” to overturn their deficit. “Of course, we do have a plan. On Thursday, we will have to play in a more offensive way taking into account we lost the first game 0-3,” the Belarusian said. “We hope we’ll try to score quickly, maybe. Miracles do occur in football and why not it occurs tomorrow? Chelsea’s Argentine striker Gonzalo Higuain did not travel with the squad. Dynamo will be without suspended midfielder Vitaliy Buyalskyi and forward Benjamin Verbic, who tweeted on Thursday that he was suffering from an illness. 90% of sides to score at least three goals in the first leg of a Europa League knockout tie have progressed to the next round (73/81). Dynamo will host Chelsea in a European encounter for the first time since October 2015, when they drew 0-0 in a Champions League group stage match. Dynamo have progressed from their last two Europa league knockout ties in which they have lost the first leg away from home – both during the 2014-15 campaign, knocking out Guingamp in the last 32 and Everton in the last 16. Of sides still in this season’s Europa League, only Eintracht Frankfurt (six) are on a longer current unbeaten run away from home in the competition than Chelsea (five – W4 D1).